It’s a fun activity that includes walking, lying down, running up and down and sliding on the field of snow! What fun to run around in the field of snow! What fun to go downhill on a sleigh! How breath-taking to take in the scenery of the Northern Japanese Alps and Mt. Ontake! How extraordinary to have coffee out in the snow field! Anything you do here will turn out special! What’s so special about this tour? Don’t worry about gear. Just dress warmly. That’s enough! It’s a 30-40 -minute drive from either Takayama or Gero. If you take the train to Hida-Osaka Station, free transportation to and from the station is available. Your pets are welcome, too! ※The pet owners are responsible for their pets. Lunch at a warm and cozy local restaurant is included in the tour. You will get to try the local specialty, kosenyudofu—tofu cooked with the local spring water. Please be responsible for the feeding and waste removal of your pets. Hida-Osaka Waterfall Trekking Office is not responsible for any trouble related to your pets, including trouble between your pets and other participants. If you plan to use transportation offered by the Hida-Osaka Waterfall Trekking Office and you have a pet, please bring a cage to transport your pet. Pets are not allowed inside the restaurant during lunch. It’s your responsibility to keep your pets protected from the cold. Meet at Hida-Osaka Visitor Center and check the gear. Arrive at the snow field of Suzuran Kogen. You will be driven up to the trail head, stopping at an observation point on the way. Finish hiking and leave the field. Return to Hida-Osaka Visitor Center and finish the tour. Let’s walk together on the snow field! How about running down the hill? Forests in winter are so picturesque! The guide will tell you what’s hidden in the forests. Look at the doggy’s happy face! The guide will take you snowshoe hiking for 2 hours. Other than hiking, you can enjoy sledding, looking for traces and foot prints of animals, and having coffee time outside. After the tour you can enjoy the delicious local dish of kosenyudofu—tofu cooked with the local spring water—at the warm and cozy restaurant. We will look at the pictures taken during the tour while we enjoy lunch. You may want to soak in the hot spring to warm up after the tour. Available every day from Saturday January 12 to Sunday March 17, 2019. Free transportation from Hida-Osaka Station is available. Please make a request at the time of reservation. Age range: 12 years and older. 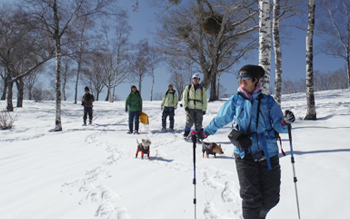 Experience in snow sports or snowshoe trekking is helpful. Participants need to be strong enough to walk by themselves with snowshoes on for the whole tour. Please be aware that some degree of physical toughness is required when walking with snowshoes. Hida-Osaka Waterfall Trekking Office reservation desk will ask about your experience at the time of your reservation. 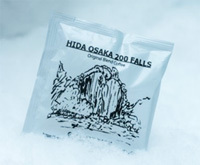 Please feel free to contact Hida-Osaka Waterfall Trekking office in advance of your reservation if you need advice. Please contact us if the number in your group is more than 10. JPY 6,500 per person including the guide, gear, and lunch. Please make a reservation via our website at least 3 days before the tour date. Reservations by phone are also available until 4:00 PM on the day before the tour date. Reservations will be closed on any given day when the maximum number of participants is reached. Cash to be paid on the day of the tour, or PayPal. Your drink, such as hot water or hot tea. Snowshoes, snow boots, rain coat, rain pants, and gloves. ※Gear sizes are limited. Hida-Osaka Waterfall Trekking Office will ask your size at the time of your reservation. Those who stay overnight in Hida-Osaka and those who have previously come on our guided tour will receive a drip bag for one cup of local blend coffee. Hida-Osaka Waterfall Trekking Office will contact all participants by 5:00 PM on the day before the tour date if unsuitable weather is forecast and the tour is cancelled. Tours can be called off even on the day of the tour if the Hida-Osaka Waterfall Trekking Office determines that the road conditions are too dangerous or if the road is closed because of heavy snow or a snow storm. The full fee will be charged to participants who cancel their tour after 5:00 PM on the day before the tour date.